A gramophone is one of those old timey record player things with a giant horn. They have a cool steam punk style that is perfect for Damian Nogueiras’ twentieth century-themed, 1:4 scale puppet play set. Of course, a real gramophone would be too big at that scale, and finding music to play would have been nearly impossible anyway. So, Nogueiras decided to build the RaspiPhono, a scaled-down gramophone that plays music through a Raspberry Pi. In his comprehensive Instructables tutorial, Nogueiras walks you through how he built the RaspiPhono, so you can follow along and create your own. It may look antique, but it’s constructed completely from new material. That starts with a balsa wood fruit box and basswood, which is glued and screwed together and then stained with an antique oak finish. Next is the horn, which is mostly made of thick tin foil meant for embossing. Some additional material, like modeling clay, is necessary to get the form right. A simple crank made from a wire clothes hanger and a push button is used to trigger the music. The final mechanical part is a spinning turntable, which is constructed out of paperboard and polyester cloth. The music itself is played on a Raspberry Pi Zero W, and the audio output is boosted through a small MAX9835 amplifier from Adafruit. Noguerias has provided the code to make everything work together, so you just need to grab some old ragtime music from archive.org and start listening! 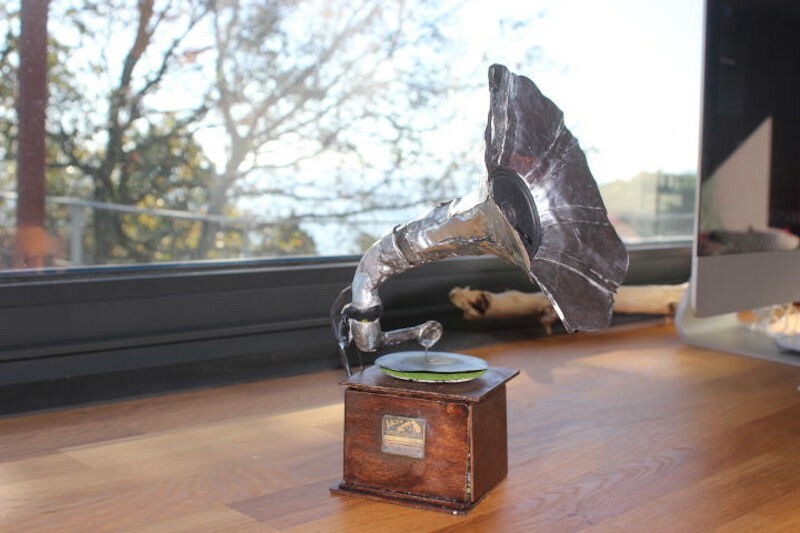 This Raspberry Pi Gramophone Is the Perfect Set Piece for a Puppet Theater was originally published in Hackster Blog on Medium, where people are continuing the conversation by highlighting and responding to this story.